Must be 21 or older to reserve. A 50% deposit by credit card is required at the time of booking, with the remaining balance due 30 days prior to arrival. For reservations made within 30 days of arrival, full payment is required at booking. Remaining balances will be charged to the credit card on file 30 days prior to your arrival date. If you wish to pay with a different card or another form of payment, please notify us prior to the 30 days before your planned arrival. MOVING/CHANGES TO RESERVATION - Changes to reservations must be made 30 days prior to arrival. In the majority of instances, we are able to move your reservation to another date for a processing charge of $75 (this should be done at least 30 days prior to your arrival). Rescheduled reservations are non-cancellable. Please be aware that there may be additional charges as well, depending on the rate originally paid, the date you are moving your reservation to, and any other changes that may occur. Changes to the number of days must be made thirty days before arrival. Due to the nature of our business, and the fact that the majority of our guests generally book our cabins well in advance, we require a minimum of 30 days notice in order to give a full refund of your deposit less a $75 cancellation- processing fee. Cancellations made within 30 days to arrival date, early departures, and no shows are obligated for the entire reservation. Exceptions may be made for extreme unforeseeable circumstances such as death in the family or active duty military. We must be contacted directly, documentation is required, and subject to approval. Rescheduling in these circumstances may be permitted. When renting multiple cabins or one of our lodges(Chestnut Lodge), we require 45 days advance notice in order to receive a full refund of your deposit less a $100 cancellation - processing fee. You are liable for any damage to the cabin or its furnishings. The cabin was inspected before your visit to ensure all your furnishings are in proper condition. Accidents happen, so please report any damaged or lost items so we may promptly replace them for other guests. The cabin will also be inspected after your visit and you will be contacted if any unreported damage is found. Housekeeping issues must be reported on arrival, so we can send the housekeeper to the property with our Housekeeping Manager to go over the property again. Please also report any problems that arise during your stay immediately so we have the opportunity to correct them. Please be aware that you are traveling to the mountains and in our area there are certain factors that we cannot control, while we do our absolute best to do so. For example; the presence of insects, animals outside of the property, internet connectivity, fireplace use, hot tub efficiency, and interruption in utilities are not cause for a refund. We cannot correct or compensate for problems reported after your stay. 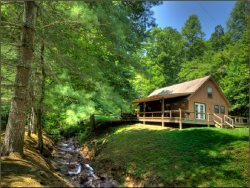 All of our cabins are equipped with basic kitchens which include; coffee makers, toasters, microwaves, pots, pans, dishes, and utensils. We also provide all of your linens and towels (although we do ask that you bring your own towels if you plan to participate in outdoor water activities). Your cabin will also be stocked with one roll of paper towels and one roll of toilet paper per bathroom upon your arrival. We ask that you provide any additional paper products that you may need. We recommend you considering bringing the following items: Flashlights, portable cd/radio, cards, games, paper products, starter logs and firewood for the campfire pit, and candles with matches in case of any power outages. Also, if you plan on tubing or rafting you may want to bring a pair of old sneakers that you don’t mind getting wet. There is a Dollar General, Family Dollar, and Fred’s (our mini Wal-Mart) and an Ingle’s supermarket just a few miles from your cabin where you can find many of the items that you may need. For the homes that allow pets. We allow well-mannered, house broken pets We request that when you’re not at the cabin, when possible; take your pet with you. If your pet is of the barking kind, and you must leave them behind, please leave them indoors, preferably crated. For the safety of other guests in the area, please do not leave your pet unattended outdoors. Most dogs enjoy jumping and playing in the creek. Please don’t allow them back in the cabin until they are fully dry. Pets are not permitted on furniture, bedding, or in hot tubs. The reason we allow pets is that we are animal lovers ourselves and could not imagine going on vacation without our pets. We only ask that you follow these simple rules. Due to the extra time involved in cleaning a cabin and the additional liability insurance that we must carry because we allow pets, we must charge a $50 non-refundable pet fee for up to two pets and additional fees per pet beyond the two. Pets are not allowed on bedding or furniture. Guests are also responsible for any damage caused by their pets and agree to pay for any charges that might arise from said damage. If we haven’t been advised that you brought a pet, and our cleaning staff informs us otherwise, there will be an automatic nonrefundable fee of $150 charged to the credit card on file and additional charges for damages and laundry cost. For the courtesy of our non-smoking guests, we ask that you refrain from smoking inside the cabin at all times. Ashtrays are provided on the porches of all cabins. If there is smoking in the cabins, odor of smoke, or damage from smoking to the cabin, there will be a $100 additional cleaning charge automatically charged to your credit card. Thank you for your understanding. Internet, cellular services, and phone services in the mountains are not always reliable. Not all cabins have internet access. No Disruptive behavior. Please remember that this is a peaceful mountain community and that neighbors, although they may not be visible, are present. Keep music and conversation at reasonable levels, drive safely, respect that there are other property owners within the community. Please don’t trespass against our neighbors unless invited. Disruptive behavior can lead to forfeit of monies paid and bring asked to vacate the premises.